Google has just announced the ground-breaking new Nexus 7 tablet with prices starting from $199, which happens to be the exact same price Amazon is asking for its Kindle Fire tablet. But there’s a world of a difference - the Nexus 7 comes with a much more powerful quad-core chip and 12-core graphics, as well as a front-facing camera and a full Android 4.1 Jelly Bean. The Kindle Fire looks pretty dated when put along with the Nexus 7. But if you thought Amazon will just sit and wait to see how Google sells millions of its new tablet, you’re mistaken. The first Kindle Fire 2s will start shipping on August 7th, and Amazon has already ordered 2 million units from Chinese manufacturer Quanta, according to China Times. Now, if you pair this with a rumored announcement of the second-gen Kindle Fire for July 31st, this is one rumor that we hope comes true. So far, sources agree that the new Fire will feature a metal frame with otherwise plastic body, with the display made by LG and touch panels by TPK. 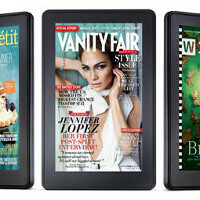 Now, this here rumor doesn’t mention anything about a Kindle Fire with a larger screen. With the Fire and the Nexus entering direct fight, and a rumored mini iPad coming this Fall, we’d definitely be bracing for one of the hottest seasons for smaller and more portable tablets yet. could be a good thing if it is able to access all the apps of the Android store which numbers in the thousands I am a Windows GUY but for 200 bucks man I would buy one. I hope Microsoft puts out a Windows "RT" 7 inch tablet for WINDOWS AND PC FANS LIKE ME. Microsoft should remove Office from Windows RT so they could license Windows 8 RT for 7 inch tablets cheap enough for OEM's to use it. Yes, this, or at least just offer a basic Office suite, like only Word and maybe Powerpoint or Excel. I really dont see the point of anything besides those on a tablet anyway. Word is great of course to have on the go, Powerpoint is even better for on the go, Excel is a little iffy but a pretty important office app so why not. Basically make it a suite competitive to cheaper products like Quick Office.